'Backdoor pipeline' leads visitors into darkness and out into the light. 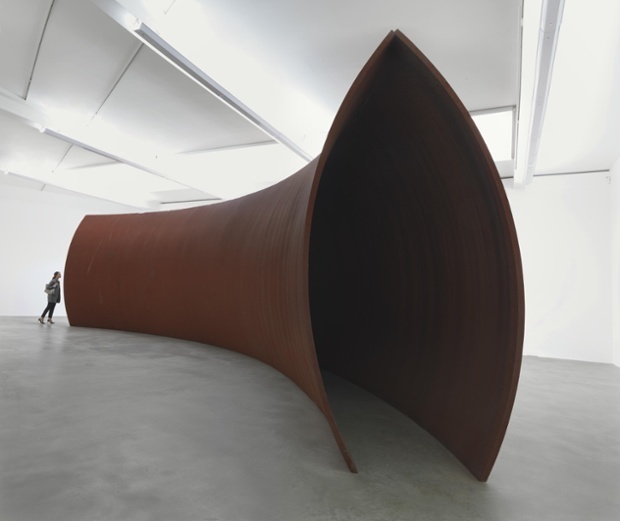 Courtesy Richard Serra and Gagosian. The precariously balanced 'London Cross'. Courtesy Richard Serra and Gagosian. The mazy 'Ramble'. Courtesy Richard Serra, Mike Bruce and Gagosian. The coffin shaped 'Dead load'. Courtesy Richard Serra and Gagosian. 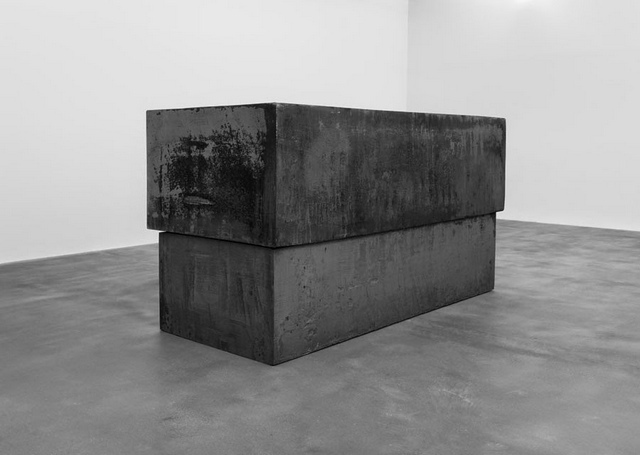 Richard Serra is a sculptor whose strength lies in scale and the power of large simple forms, and that's evident in this exhibition of four massive works now on at the Gagosian Gallery. The opening work is a curved tunnel that appears dark at first, though once inside the light is visible at the other end so it never feels claustrophobic. The shape of either end of this pipeline resembles the tapered arches visible in Gothic cathedrals and Islamic architecture, hinting at the religious connotation of entering the darkness then stepping into the light. In the adjacent space stand 24 blocks of weathered steel creating a mazy path that visitors can navigate through. Passing each slab inevitably leads to another but as they are too tall to peer over there is a sense of discovery as you never know when they will end. The blocks appear uniform but each one varies in height and has been weathered in a different way. They feel like a group of individual sentinels keeping watch. One work, called London Cross, actually required the gallery to be re-built — it's obvious why when you see the two slabs of steel in a cruciform shape with one balanced upon the other. It looks so precarious that walking under the suspended steel piece is almost an act of faith — hoping that it won't fall and crush you. Then lastly, there is a work in the shape of two giant steel coffins set on top of another, the clearest piece alluding to the cycle of life and death. 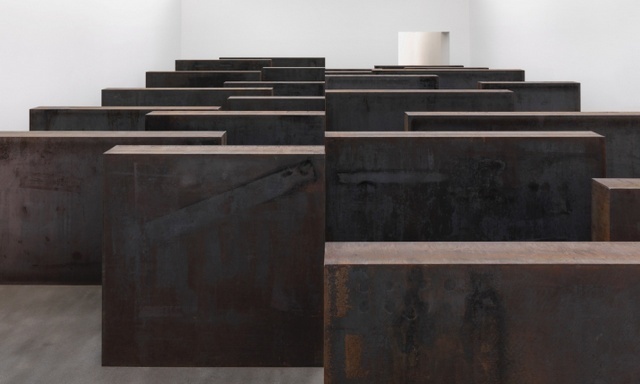 Through these massive sculptures Richard Serra tackles the heavy subject of mortality in an exhibition that feels foreboding yet also encourages exploration. He's an artist who is most effective working at a large scale and in this instance has created a powerful show. 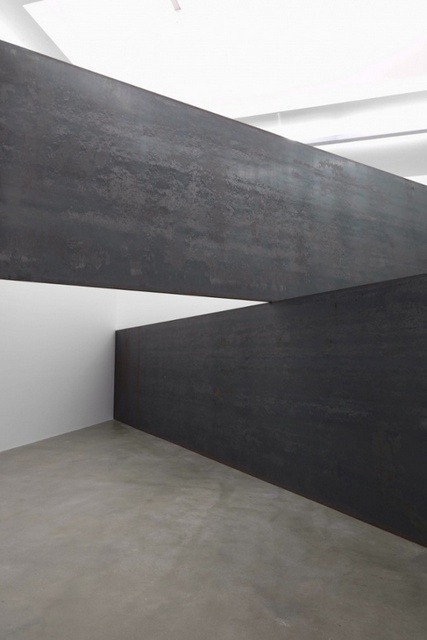 Richard Serra's exhibition is on at Gagosian London, 6-24 Brittania St, WC1X 9JD until 28 February. Entrance is free. For more great art to see in London, visit our October listings.